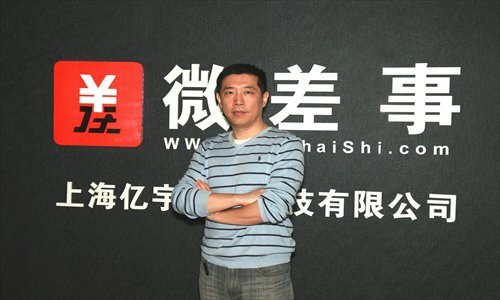 Pei Qiao, CEO of Shanghai Yiyu Technology Inc. Photo: Courtesy of Shanghai Yiyu Technology Inc. There is a new way of making money in your spare time, by using a mobile phone app called Micro Task. Micro Task works by using crowdsourcing to connect companies with a large group of consumers. Companies assign small tasks, which are completed by the app users. Micro Task already has more than 1.2 million registered users, and users who complete the maximum number task can earn up to 5,000 yuan ($800) a month. “We pay real money for consumers to complete tasks assigned by the brands and marketers,” explains Pei Qiao, CEO of Shanghai Yiyu Technology Inc.
With the popularity of mobile phones, people spend more and more time on the phone. Pei long had the concept of creating an app that would let people make money using their mobile phone. With help from his partner Pu Jun, who worked at Coca-Cola, he developed Micro Task. Launched in January 2013, Micro Task is a B2C (business-to-customer) task exchange platform based on the concept of crowdsourcing. Companies can send their tasks to Micro Task users. These tasks are usually easy to complete and require little time and no special skills. For example, users might be required to inquire about a certain brand of soda in a particular store, or take a photo of a particular gate at an airport. They can finish the task in their spare time, and are paid using Alipay. There are five types of tasks: data collection, market research, business inspection, interactive marketing and customer invitations. The payment for tasks varies from one yuan to more than 1,000 yuan. To make the app easier to use, tasks are divided into two categories, things that can be done anytime and anywhere and things that need to be done in a certain location. “Companies can get timely and precise data with wide coverage and low cost from the customers. In addition, companies can form a direct connection with customers in order to create or expand a following for their brand. Users, can make extra money in their spare time, and even establish social contacts through like-minded groups of consumers,” says Pei.